“Yuuyaraq encompasses everything in our Yup’ik way of being,” says Mark John, Calista Education and Culture, Inc. (CEC) Cultural Advisor. CEC is Calista Corporation’s nonprofit arm and continues working to bring traditional values into the classroom. 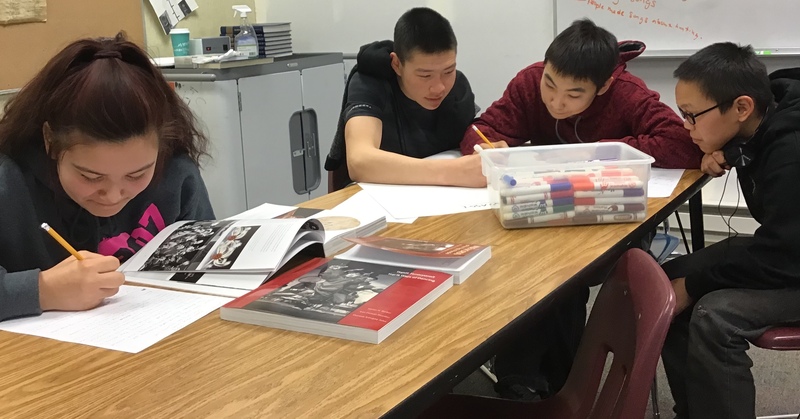 The Lower Kuskokwim School District (LKSD) based in Bethel worked with CEC to pilot and implement the Yuuyaraq curriculum over the past three years through a federal US Department of Education Alaska Native Education Program grant. The Yuuyaraq class first began as an equivalent to the 7th and 8th grade Personal Life Skills. It then expanded to include a high school Personal Life Skills class and Health I and Health II classes. Each class received input from a steering committee of curriculum writers, school teachers and officials, and Yup’ik elders. “We would figure out as a group of curriculum writers how to meet the state standards but remain faithful to the message and intent of the Elders,” says Gayle Miller, former LKSD Director of Academic Programs. Each Yuuyaraq class went through many rounds of editing and practice to work for each stakeholder group—the school, the teachers, the Elders and the Youth. Following many rounds of edits, and after piloting the classes for a semester each, the partnership between CEC and LKSD began implementing Yuuyaraq classes in the fall of 2018. A catalyst for creating the curriculum came from the fact that many Elders had already been interviewed. CEC published books based on the experiences and the words of the Elders from our Region. These books were adapted as materials for the class—some lessons coming from the book ‘Wise Words of the Yup’ik People: We Talk to You Because We Love You’ by Ann Fienup-Riordan and Alice Rearden. “After all the books had been published and all the information had been gathered, one of the requests the Elders made was that information be shared with the Youth. This is one way for us to do that,” says Rea Bavilla, President and CEO of CEC. Videos of Elders telling a story related to each lesson is a chance for students to learn—in a sense—directly from the Elders. Eva Panruk, an LKSD Associate Teacher from Chefornak, piloted the Yuuyaraq classes and Health I & II high school classes. Students at Lewis Angapak Memorial School in Tuntutuliak taking the Yuuyaraq class. As a teacher, Panruk saw the Yuuyaraq lessons make a lasting impression in the life of a 7th grade student. He changed his behavior, listens in class and became more invested in school. Miller says many Alaska Native youth have more or less been educated on foreign principles for a long time. Yuuyaraq brings Yup’ik values and a Yup’ik mindset to the classroom. Next steps for CEC are to build the curriculum and bring Yuuyaraq to more schools in the Region. Sign up for Calista Corporation Updates via email.